The hearing, held in Port Angeles at the end of April, was part of a National Oceanic and Atmospheric Administration’s (NOAA) Fisheries public comment process for a draft environmental impact statement for the tribe’s whaling proposal. There are six options, including no whaling and the tribes’ proposal of the harvest of up to five Eastern north Pacific gray whales a year. The Eastern north Pacific gray whale was removed from the federal Endangered Species list in 1994 and the populations is estimated to be 20,000 animals. The tribe filed notice in 1995 to resume its treaty-reserved right to whale and harvested one gray whale in 1999. It was the first whale that the tribe had harvested since it voluntarily stopped whaling in the 1920s when commercial whaling had decimated gray whale populations. Following the 1999 harvest, legal challenges by animal rights groups forced the tribe to request a treaty whaling right exemption under the federal Marine Mammal Protection Act. The exemption requires an extensive review process that included public testimony from throughout the region. 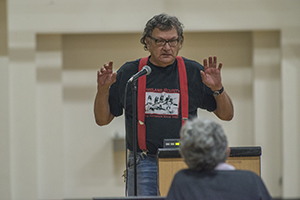 About 100 people attended the Port Angeles meeting, including a contingent of Lower Elwha Klallam tribal members who sang a song of support for the Makah Tribe. Makah fisherman Jason Roberts said some of the options in the tribe’s plan as put forth by NOAA would reduce the hunt’s likelihood of success to the point where it would be the same as not allowing the tribe to hunt at all. “I have fished for 20 years and you don’t see the whales outside of 5 miles off the coast, so if forced to hunt outside of that, it would make the likelihood of success low,” Roberts said. He noted moving the hunt to times different than the tribe’s proposal would mean less desirable weather and heavier seas, further reducing opportunity. Meanwhile, the International Whaling Commission, which governs global whaling, continues to support the tribe’s current approved quota of harvesting up to five Eastern north Pacific gray whales a year through 2018. Comments on the draft and the alternatives presented will be taken until June 11, 2015 To comment go to: http://go.nwifc.org/whalecomment.